The Wild Turkey is the largest bird nesting in Tennessee. This large bodied, big footed species only flies short distances, but roosts in trees at night. The historic range of the Wild Turkey extended from southern Canada throughout the United States to central Mexico. It was a very important food animal to Native Americans and early settlers, but by the early 1900s over-hunting eliminated this species from most of its range, including much of Tennessee. Modern wildlife management has reestablished this bird throughout its historic range and into 49 of the 50 United States. Description: The Wild Turkey is a large, dark ground-dwelling bird. Males are larger than females. In late winter and spring when the male is courting females, he has a white forehead, bright blue face, and scarlet neck. All males and some females have a tuft of feathers on the chest called a beard. Length: Male 46", Female 37"
Wingspan: Male 64", Female 50"
Weight: Male 16.2 lbs., Female 9.2 lbs. Voice: Male makes a fast descending gobble and females make a loud, sharp tuk, similar to a chipmunk. 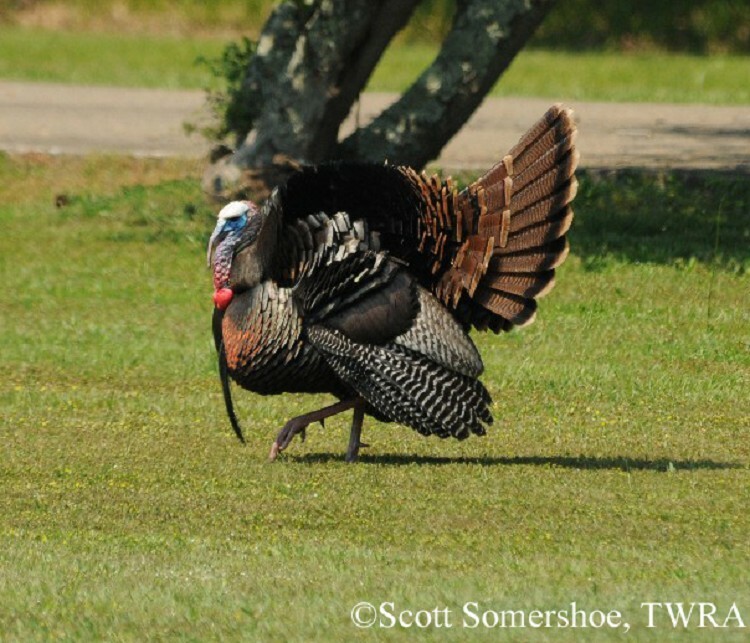 Domestic turkeys can look similar, but have a white tip to the tail (see Fun Facts below). Habitat: Mature woodlands with scattered openings or fields. Diet: Acorns, nuts, seeds, fruits, insects, buds, fern fronds, salamanders. Nesting and reproduction: Dominant males establish territories starting in late winter and attract females by gobbling. When the female appears, he puffs up his body feathers, and struts around her with his tail spread and wingtips dragging on the ground. Dominant males will mate with several females in one season, but the female alone builds the nest and cares for the young. Clutch Size: Ranges from 7 to 14 eggs with an average of 11 eggs. Incubation: The female incubates the eggs for 27 to 28 days. Fledging: The young leave the nest shortly after hatching and follow the female. They begin to fly at 6 to 10 days old. Male young remain with the female until the fall; female young remain with the female until the spring. Nest: The nest is a simple depression on the ground lined with dead leaves or grass, usually placed at the base of a tree or bush and concealed in thick vegetation. 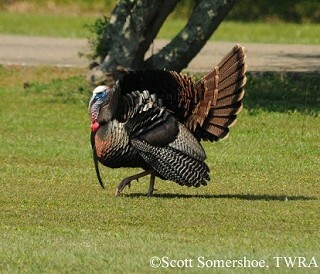 Status in Tennessee: The Wild Turkey is a common to uncommon permanent resident throughout the state. By the early 1900's populations had crashed due to unrestricted hunting, land clearing, and the loss of the American Chestnut, which was an important food source. As a result of reintroduction efforts by TWRA, the Wild Turkey is now found in every county in the state. Winter flocks in Tennessee may exceed 400 individuals. The Wild Turkey is native of North America and is one of only two bird species domesticated in the New World; the other is the Muscovy Duck. In the early 1500s, European explorers took Wild Turkeys from Mexico for domestication in Europe. When Europeans colonized the Atlantic Coast, they brought these domesticated turkeys with them. The Mexican subspecies has a white tip to the tail and this trait can be used to distinguish wild from domestic birds. The male Wild Turkey provides no parental care. The female alone incubates the eggs. They follow her immediately after hatching, she feeds them for a few days, but they quickly learn to feed themselves. Several females and their broods may form flocks of 30 or more birds. Best places to see in Tennessee: Found in every county in the state. Good places to see include Natchez Trace Parkway and the Warner Parks in Nashville. Eaton, S. W. 1992. Wild Turkey (Meleagris gallopavo). The Birds of North America, No. 22 (A. Poole, P. Stettenheim, and F. Gill, eds.). The Academy of Natural Sciences, Philadelphia, PA, and The American Ornithologists' Union, Washington, D.C.